Lloyd Instruments Testers: Medical & Pharmaceutical Packaging - C.S.C. Force Measurement, Inc.
Force measurement equipment is used by many industries to ensure the quality, consistency, and level of protection offered by packaging materials. This includes all of the materials themselves, along with any packaging components, shipping containers, and other associated processes in manufacturing and development. Lloyd instruments testers are a popular choice for our clients, as they can perform an extensive library of tests, including tensile strength, compression, flexural, peel, shear, static, and kinetic coefficient of friction for many different industries. Lloyd Instruments material testers have a wide range of features that can be used to quickly build advanced multi-stage test routines according to industry standards. The testing that is done to packaging materials for the pharmaceutical industry can measure the effects and interactions of packaging by external forces, the contents of the package, and end-users. This includes testing for both pharmacy settings and consumers. Packaging for drugs and pharmaceuticals is highly regulated by the industry. Special testing must be done to ensure the safety and shelf life of the drugs and pharmaceuticals, as well as the compatibility of the packaging materials with the contents themselves. Other concerns include tamper resistance or “child safety” packaging, as well as sterility and other quality assurance needs. Lloyd instruments testers come in a variety of options, with different control options and abilities. The Lloyd Instruments LS1 digital material testers are a popular choice for standalone operation via a control console to increase convenience by using a PC or laptop with NEXYGENPlus software for analysis. This software is compatible with Windows and features an improved and intuitive User Configurable Test (UCT) functionality that can be used with a comprehensive test standards library. The LS1 is also a very affordable solution for materials testing applications and can be combined with a wide selection of grips, fixtures, extensometers, and other software, depending on the needs of the package testing. The packaging materials that are used within the medical industry have special user requirements and are highly regulated. What that means is that material force measurement equipment and material testers must be able to test certain properties, such as durability, sterility, strength, and barrier. Documented test results are required for both initial designs and production to ensure that industry regulations are being met. 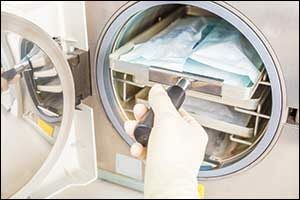 For example, suitability and sterility are critical in the medical industry, protecting essential medical devices and products in medical industry packaging. It must be able to maintain the sterility of the device or product inside while making it readily available for immediate use by physicians and medical staff. Various standards for verification and validation protocol of medical industry packaging are required and maintained. Some of the most common standards that can be verified by material testers for this purpose include ASTM F2054 Standard Test Method for Burst Testing of Flexible Package Seals Using Internal Air Pressurization Within Restraining Plates and ISO 11607-1 Packaging for Terminally Sterilized Medical Devices with requirements for materials, sterile barrier systems, and packaging systems. It is crucial to choose force measurement equipment and material testers that can record data from medical industry packaging testing that meets the criteria of the medical industry. There are many valuable advanced features that are available to manufacturers and testing facilities that choose to use Lloyd Instruments force measurement equipment. LS1 Digital Material Testers feature a membrane multi-function keypad and an easy-to-read backlit LCD for load and extension information display. Prompts and menus are displayed via the control console, which is designed to guide the user through all of the operational options of the machine. Choose from a selection of 10 programmable test set-ups and store up to 600 test results, which can be downloaded via USB connection and analyzed with NEXYGENPlus data software. The test standards library covers ISO, EN, DIN, ASTM and many other standards. To see a full list of Standard Features, Hardware Options, and Specifications for the Lloyd Instruments LS1 Digital Material Testers, you can visit CSC Force Measurement and view our available product listings. We also carry other Lloyd Instruments testers, including the LS 2.5 Digital Material Tester and the LS5 Digital Material Tester. To get a quote or place an order, contact CSC Force Measurement directly by calling toll-free 1-800-866-3672.